We’d love your help. Let us know what’s wrong with this preview of Keeping the Feast by Paula Butturini. Paula and John met in Italy, fell in love, and four years later, married in Rome. But less than a month after the wedding, tragedy A story of food and love, injury and healing, Keeping the Feast is the triumphant memoir of one couple's nourishment and restoration in Italy after a period of tragedy, and the extraordinary sustaining powers of food, family, and friendship. To ask other readers questions about Keeping the Feast, please sign up. I read Keeping the Feast after hearing the author speak at a conference. She talked about writing and cooking to cure depression. Something about that combination of topics intrigued me, but I didn't begin her book for a year. Once started, I read through in a couple of days. The paragraphs below are from my blog that I wrote the minute I finished the book. "Having just finished reading Paula Butturini’s Keeping the Feast, food is much on my mind. Butturini peppered that memoir of her years in th I read Keeping the Feast after hearing the author speak at a conference. She talked about writing and cooking to cure depression. Something about that combination of topics intrigued me, but I didn't begin her book for a year. Once started, I read through in a couple of days. The paragraphs below are from my blog that I wrote the minute I finished the book. "Having just finished reading Paula Butturini’s Keeping the Feast, food is much on my mind. Butturini peppered that memoir of her years in the news capitals of Europe with lists of the fresh vegetables she bought daily in their street markets. Her descriptions of her father’s polenta-making and husband John’s risotto, in addition to the repasts she prepared, read like a cookbook. No matter that she included not a single recipe; she made me feel like I could whip up a quick pesto while a chicken roasts for dinner guests. I want my cooking to be like Butturini’s, to be a time of energetic preparation that precedes family gathering at the table. That is the way I grew up. I cannot remember eating a childhood meal alone. Our family of six sat in appointed places, passed the dishes clockwise until everyone had helped himself to a portion of each--meat, potatoes, vegetables, salad, always fresh bread. . . . "
I read this book a year ago and was touched by the author's ability to paint a picture of trauma and the ensuing depression that often follows. Shortly after suffering her own tragedy while involved in overseas reporting, her husband becomes victim of his own tragedy. I was impressed by Butturini's ability to keep her hope in the midst of such loss and despair. Intuitively she knows what they both need. She moves them to Rome where the sunshine, quietness, and the mundane activies of shopping, p I read this book a year ago and was touched by the author's ability to paint a picture of trauma and the ensuing depression that often follows. Shortly after suffering her own tragedy while involved in overseas reporting, her husband becomes victim of his own tragedy. I was impressed by Butturini's ability to keep her hope in the midst of such loss and despair. Intuitively she knows what they both need. She moves them to Rome where the sunshine, quietness, and the mundane activies of shopping, preparing, and eating meals become the rituals that heal. The author examines her own emotional wounds which stem from her mother's depression. She also brings the reader into the exciting world of expatriate journalists who cover the stories by day, and find comraderie at night over shared meals and drinks. This book is part war story, part food memoir, part psychological journey, but mostly it is a love story. *I just got back for Europe where I got to meet the author. What a sweetheart. She had lunch with my husband and myself in a little cafe down the street from her home in Paris. Paula Butturini grew up in a very Italian family, where everyone came together at the end of the day to share a good meal and stories. She held tight to this tradition through moves across the US and Europe, through a marriage and early divorce, through the shattering knowledge that her mother suffered from severe depression. When Butturini met John Tagliabue- a reporter for the New York Times- in Rome, she was grateful to have finally found someone who seemed to truly understand her, someone with whom she could start her life. They lived together reporting the fall of communism in Eastern Europe, and going through a great many troubles because of it. Butturini was beaten and bruised by riot police only a few weeks before her wedding. And only a short time after they were married, Tagliabue was shot and nearly killed by a bullet through his body. While he recovered, slowly, from the bodily injuries, he was much slower to recover from the emotional toll. Butturini soon realized that, just as her mother had, her husband too was suffering from severe and acute depression. After yet another blow hits their family, Paula and John returned to Italy in an attempt to heal their scars, depending on their happy memories of meals and walks and blossoming love in Rome to get them through their trauma. I thought this book would be a bit like A Year in Provence- a fun story of expats dealing with culture shock and eating yummy food in a foreign country. I was slightly worried about the more religious aspects of the book- Butturini is a former religion reporter, Tagliabue had a stint in a monastery, there is a quote from the Bible to start the book and a quote from a Christian reviewer on the back cover, and references to church in the prologue. However, there was very little overtly religious in the book- not enough to lessen my enjoyment of the book at all. And this book is nothing at all like A Year in Provence. Butturini has written a deeply thoughtful memoir about the pains of dealing with a family member who suffers from depression. She manages, somehow, to do this in a way that is not depressing for the reader. Butturini never makes her mother or her husband out to be objects of pity. She shows so well how strong they are, how courageous to fight an attack that takes place within their own bodies and minds. Each chapter has a type of food as a title, and each begins with a scene or memory from Butturini's childhood involving that food. She describes the people involved in the memory, the taste of the food, why the scene is so important to her. And then she brings us back to the present reality, the difficulties she is facing, the immense dread she feels to face another day that might be so very much like the last. And so it is not so much a travel memoir as a food memoir. Italy plays a role in this memoir, but not as large a role as Italian food does. As someone who truly enjoys a trip to the farmers' market and then cooking with those ingredients, I know how cathartic preparing a meal to share with family and friends can be. Butturini describes in her book how food saved her from despair, how it allowed her to bond with her mother when her mother was untouchable, and how it brought her husband back to her, in some small form, for at least an hour every day. 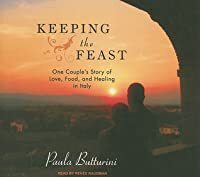 ¶ "Keeping the Feast: One Couple's Story of Love, Food, and Healing in Italy" (Riverhead Books, 272 pages, $25.95), by Paula Butturini: Foreign correspondents Paula Butturini and John Tagliabue had been married less than a month when Tagliabue was shot while covering the overthrow of Nicolae Ceaucescu in Romania. ¶ Butturini got the news on Christmas Eve. It took days for her to get to Romania and to have her husband airlifted by the Red Cross to Munich. There, a doctor told her that Tagliabue would have been dead if he'd been left in Romania another six to 12 hours. Having undergone several surgeries without antibiotics, he had an infection and raging fever. 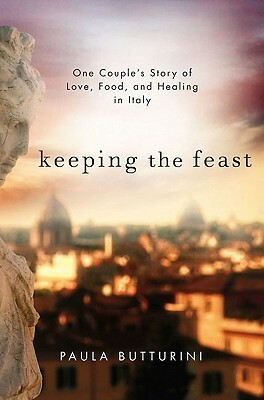 ¶ And yet, Butturini reflects in "Keeping the Feast," a memoir of their marriage, the worst was yet to come. ¶ Tagliabue recovered from his immediate wounds but developed hepatitis B from a tainted blood infusion. Then he slid into a depression that lasted for years. ¶ The silence and sense of isolation created by his depression, Butturini writes, was in many ways more difficult to deal with than an immediate crisis. To keep her own sense of sanity, she created a routine of shopping each morning at the Campo dei Fiori, Rome's big outdoor market, stopping at church on the way home and then cooking three balanced meals. ¶ "The mere action of cooking centered me, kept me close, available, ready to help, kept us fed, kept me sufficiently focused on present tasks so I wouldn't panic about the future, kept me going through the slow passing of a string of bad days, weeks and months," she writes. ¶ Butturini uses food as a catalyst for her story, moving between the account of her husband's illness and memories of her childhood and adult relationship with her mother, who also had depression and eventually killed herself. She recalls family meals and traditions, such as eating lentils to mark the New Year and neighborhood picnics of sutni szalona, which are Hungarian sandwiches featuring raw vegetables and grilled bacon on rye. ¶ The problem with "Keeping the Feast," however, is that Butturini's musings on her relationship with food is much less interesting than the events that have shaped her life. Her account of Tagliabue's shooting and near-death brings tears to the eyes, and her description of her mother's drowning in an icy river is haunting. Her listing of food she bought at a Roman market and dinners in Warsaw pale by comparison and make the memoir feel slow and rambling. This review has been hidden because it contains spoilers. To view it, click here. pg 89: Neither of us know the word wundzucker, literally ' wound sugar', but a few days later John noticed what looked like sandy crumbs in his sheets, as if he had been eating cookies in bed. It was only then that he realized that the white crystals the doctors had been pouring into his back twice a day were nothing more than sterilized sugar, administered after he had been bathed in a diluted chamomile extract, and his wound had been hosed out.......Sugar, a treatment from Egyptian antiquity, pg 89: Neither of us know the word wundzucker, literally ' wound sugar', but a few days later John noticed what looked like sandy crumbs in his sheets, as if he had been eating cookies in bed. It was only then that he realized that the white crystals the doctors had been pouring into his back twice a day were nothing more than sterilized sugar, administered after he had been bathed in a diluted chamomile extract, and his wound had been hosed out.......Sugar, a treatment from Egyptian antiquity, helps dangerously infected wounds by killing the powerful bacteria that thrive in their depths, without causing trauma to the surrounding tissue. The practice largely fell out of favor during the 1900s, as pharmaceutical companies developed increasingly powerful antibiotics to fight infection. But in the mid-1980s, German doctors turned back to sugar when they began encountering super-powerful bacteria harbored in deep wounds that did not respond to even the most high-tech preparations.Although US medical experts largely discredit the idea as quaint, European doctors who have readopted the technique say that even dirty wounds often turn free of bacteria after only several days of treatment and that the injuries tend to heal more completely and gently than with standard antibiotics. This review has been hidden because it contains spoilers. To view it, click here. I enjoyed this memoir, especially with the long descriptions of food interwoven between memories, as both metaphor and example of the role nourishment plays in loving, hurting, and healing. I thought I might get annoyed with the endless talk of food, but I am a foodie after all, and this book was just simply delicious. The only thing that was really frustrating for me was that the real reason I picked up the book--its description making a big point about how patience can be a vice and anger a vi I enjoyed this memoir, especially with the long descriptions of food interwoven between memories, as both metaphor and example of the role nourishment plays in loving, hurting, and healing. I thought I might get annoyed with the endless talk of food, but I am a foodie after all, and this book was just simply delicious. The only thing that was really frustrating for me was that the real reason I picked up the book--its description making a big point about how patience can be a vice and anger a virtue, and that sometimes we need to make demands of the mentally ill to show signs of getting better--was what had me so intrigued in the first place (it's so counter-intuitive, and counter what every one dealing with the mentally ill are inclined to do, as most treat them with kid gloves, fearful of what might happen), but in the book it got barely a mention. The author talks about one scene, during her husband's lengthy depression, when she absolutely loses her temper...and then suddenly he starts getting better. I was so frustrated at this part. I wanted to know MORE. What was it about her losing her temper that helped? How did it help? It's especially maddening since John apparently has no memory of this turning point, yet clearly it was important. Even if she couldn't pinpoint what happened or why, spending a little time speculating would have been helpful. Similarly, the demands she made on John get barely a mention. For something that was so important it warranted inclusion in the book's description, I expected much more discussion of those two aspects. While on assignment in Rome, Paula Butturini, a foreign correspondent for UPI, met John Tagliabue, himself a correspondent for the New York Times. Talking for hours over meals they loved cooking as much as eating, they fell in love (John later confessed, " I knew very quickly that wherever you were would be home."). Little did they suspect when John was reassigned as the Warsaw bureau chief and Paula was hired by the Chicago Tribune as their Eastern European correspondent that their lives would While on assignment in Rome, Paula Butturini, a foreign correspondent for UPI, met John Tagliabue, himself a correspondent for the New York Times. Talking for hours over meals they loved cooking as much as eating, they fell in love (John later confessed, " I knew very quickly that wherever you were would be home."). Little did they suspect when John was reassigned as the Warsaw bureau chief and Paula was hired by the Chicago Tribune as their Eastern European correspondent that their lives would be drastically altered. Three weeks before their wedding, while covering the Czech revolution in Prague, Paula was severely beaten by Czechoslovak antiterrorist police. A short five weeks later, John was hit by a sniper's bullet in Romania where Nicolae Ceausescu had just been deposed. Their lives would never be the same. There is much to be said for catharsis; while writing this memoir, Paula Butturini must have found the retelling of her families' battles with post traumatic stress and depression to be both frightening and reaffirming. Life does go on. I picked this book up as much for the cover as any other reason. Fully believing I had in my had a different boo by pretty much the same name. The subject matter is not the easiest to read, but I highly recommend the book. Especially if you are any kind of foodie. Paula's thoughts and style put me in mind of Judith Jones. Food & meals can be the main track that keeps a person/family/household on an even keel. It is rare to find a memoir on Italy that doesn't fall into the world of cliche. This book manages to discuss food, Italy, and family and keep it fresh and interesting the whole way through. Not only that, but she is able to present a powerful story about the devastating effects of depression on a family. At times sad, the author is able to make us feel the difficult times that her family faces but also allows us to feel joy and peace with them as they overcome with the help of friends, faith an It is rare to find a memoir on Italy that doesn't fall into the world of cliche. This book manages to discuss food, Italy, and family and keep it fresh and interesting the whole way through. Not only that, but she is able to present a powerful story about the devastating effects of depression on a family. At times sad, the author is able to make us feel the difficult times that her family faces but also allows us to feel joy and peace with them as they overcome with the help of friends, faith and food. This is a lovely book I highly recommend. Bone-baring honesty shines the light on life's problems that visit us all. At once it carries a beautifully coordinated theme of family, love and tradition through food, counterpointed with the pain of trauma, depression and disappointment. Warning: reading this book may bring about cravings for not only food, but a trip or two to Rome. If you, like me, wanted "Eat Pray Love" to end after the "eat" portion, this is your book. "Keeping the Feast" is a beautifully written food memoir about loving someone battling depression. In many ways, it felt like "The Year of Magical Thinking" meets "Under the Tuscan Sun." I'm glad I stumbled across this one and took my time reading it. A slow read. I liked the descriptions of Italy and the food. But sometimes the writing was a little loose and could have been edited a little more tightly, IMHO. The story dragged a little (especially the slow recovery and the depression) and it seemed to take me forever to read, but I liked it well enough. This is one of those books that must be savored. The lives described and shared must be absorbed slowly into your soul. They must be appreciated for their resilience. We all need to keep the feast...it may save us. True story of a reporter that was shot and his long battle back to health. Big part of book was author' husbands fight with depression. Book was a bit tedious but descriptions of food were phenomenal...really made me want to cook, which is pretty close to a miracle! Another food/life memoir that made me want to travel and stuff my face full of food. The author and her husband are both reporters in Europe in the early 90s and suffer a series of on the job injuries, and heal through food and therapy. I absolutely loved this book. Magnificently written with courage, grace and overwhelming inspiration. The author tells of the pleasures of eating and cooking while encountering depression and tragedy. I was left deeply moved and I will never forget this book. It read like a self-involved therapeutic diary, which i guess is basically what it is. the writing and construction are not enough to cover the "who cares?" factor. I loved the parts about Italy and the food. A very interesting book on the power of food, rituals, and love in the wake of depression. I didn't expect much from the book, but ended up really liking it. This was just a lovely book. A beautiful, touching memoir of recovery from disaster. I marvel at the author's patience and tenacity. Wasn't as upbeat & Romantic as I thought...Loved all the "food" talk, references etc. The Depression bouts were Depressing!! But an interesting read! ending felt a bit rushed? Nice story, just wish it had more detail and more specific stories.